Transportation Costs > How Much Does a Spray In a Bedliner Cost? How Much Does a Spray In a Bedliner Cost? If you want to protect the bed of your truck from rust, scratches, and marks, the best option you can use is by applying a spray-on bedliner. A spray-on bedliner is a thick coating which is applied to truck beds. Compared to putting on a plastic or a canvas cover on the truck bed, a spray-on bedliner is easier and more convenient to use. How much does a spray in bedliner cost? If you want to have a professional do the job for you, the costs can be anywhere from $350 to $800, depending on the product being used. On the market, you will come across two popular products: Line-X or Rhino, and from our research, most of their estimates were close to each other, so it really came down to a personal preference on which one you wanted to use. If you want color matching, additional surface spraying and a UV protectant, then the costs will be closer to the $800 mark; however, if you just wanted something basic from a third-party, no-name company, then the costs could be closer to the $350 range. DualLiner, for example, talked with 248 installers over the phone, and according to their responses, Line-X installers wanted an average cost of $481, while Rhino installers had an average cost of $470. This Edmunds article said they could have equipped a Ford F-150 with a factory spray-on bedliner for $475, but at a local Line-X franchise business, the cost was about the same, $485. A UV-resistant topcoat that prevented the paint from faded could have been added for $150 more. The article then goes on to show you how the bedliner process works at the shop. The official Line-X website says its spray-on bedliner starts at $500. A spray on bedliner kit, if you were to do it on your own, should come with a spray gun, bed armor, and/or other features. Refer to the packaging to confirm the items inside. This installation can be done either with heat (aromatic) or without (aliphatic). Application with heat tends to be more durable at repelling UV rays, allowing it to keep its color. Application without heat, on the other hand, is usually the cheaper option, but it may fade over time. The majority of spray on bedliners are black in color; however, professionals can match the color on your car for an additional fee. 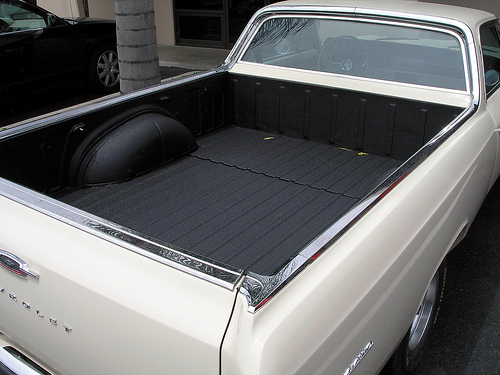 Spray on bedliners can be either smooth in texture, making it very easy or clean; they can also be rough, like the texture of sand, to provide traction and prevent slipping. During the procedure, the bedliner will be taped off, similar to a wall in a home near the ceiling. The liner will then be applied to the entire truck bed, and the installer, most of the time, either use a Rhino, Line-X or third-party product. After the liner has been applied, it will be allowed to dry for up to two hours. After it has been dried, an additional coat can be added if necessary. The Rhino product will often be applied by using a hot, hot-pressured system, whereas the Line-X process will use a high pressure spray system. The installation time will greatly vary depending on the installer. Most, however, stated it should take four to six hours to complete the job. Line-X and Rhino do offer a nationwide lifetime warranty on its products, but some third parties may not. Many professionals will stick to a standard color such as black. If you want an exact match with the colors, you may have to spend an additional $50 to $150. If you were to use a Line-X bedliner, then a UV-resistant coat can often be added for about $150 or closer to $400 if you wanted the paint to match the truck’s color. Without this, your liner may fade over the next few years. If you want two coats, you will have to pay extra for supplies as well as installation since the job will take twice as long. What kind of application process do you use? A hot process, according to Tundra Headquarters, is the way to go since the final product looks much cleaner. Some installers, however, still use the cold application, which can often create a dry and “runny” look. How long do you prep? The longer they prep, the better the product will look. Most dealers can prep in less than 15 minutes, but if they were to power sand, the process could take well more than an hour. A good installer will remove the accessories inside the bed and sand the surface. How long have you been doing this? As with anything, the longer they have been doing it, the better. If you were to buy a Rhino or Line-X product, for instance, the installers must abide by the warranties. If they go out of business or are a fly-by-night business, then you may be out of luck if something were to happen in the future. Can I look inside your shop? A good shop will always have a cleaner and well-organized atmosphere. A dirty shop filled with dirt and dust, unfortunately, can contaminate the spray, creating a poor product in the end. If a shop doesn’t allow you to look inside their shop, then it may be best to go elsewhere. If you are purchasing a new truck, negotiate and try to get a truck bedliner included with your purchase. Compare products and quotes. It’s best to talk with at least three to five installers before proceeding. If you don’t mind getting your hands dirty, consider doing the job on your own. The cost of a spray in bedliner, if you were to purchase it on your own, will vary depending on the brand and who you use. On average, the cost of the spray can cost anywhere from $85 to as much as $175 for a complete kit. Again, this is for the materials only and will not include the professional installation if you were to need it. On Amazon.com, for example, you can find various spray-on bedliner product kits and the corresponding prices.